B. F. Skinner was an American psychologist. Gary Chalmers's dad used methods by B. F. Skinner to raise him. It made him feel humiliated. 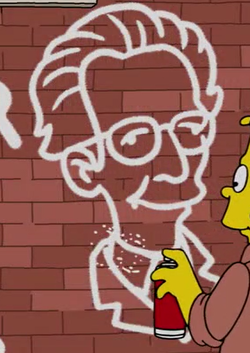 Bart spray painted an image of B. F. Skinner with the caption "B. F. Skinner was a weiner" on the wall at Harvard College. Modified on December 4, 2017, at 12:26.